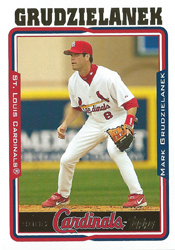 After considering Roberto Alomar and Alex Cora, the Cardinals chose Mark Grudzielanek to be their second baseman in 2005. On Jan. 6, 2005, Grudzielank, a free agent, signed a one-year, $1 million contract with the Cardinals. He replaced Tony Womack, who became a free agent and signed with the Yankees after hitting .307 with 26 stolen bases for the 2004 Cardinals. Grudzielanek, 34, hit .307 in 81 games for the 2004 Cubs after missing the first two months of the season because of an Achilles’ tendon injury. Alomar, 36, was nearing the end of a Hall of Fame career. A free agent, he had played for the Diamondbacks and White Sox in 2004. A final season with a contender such as the Cardinals was appealing. Instead, after the Cardinals passed, Alomar signed with the Rays but retired before the 2005 season started. Grudzielanek began his big-league career with the 1995 Expos. He hit .281 in four years with the Expos, .284 in five years with the Dodgers and .312 in two years with the Cubs before joining the Cardinals. “We’re getting a guy who will fit in with our club for a lot of reasons,” Walt Jocketty, Cardinals general manager, told the Post-Dispatch. The Cardinals got what they expected. In 2005, Grudzielanek led National League second basemen in fielding percentage (.990) and double plays turned (108). He batted .294 (155 hits in 137 games) with 30 doubles and 59 RBI. Only Albert Pujols (38) and Jim Edmonds (37) had more doubles for the 2005 Cardinals than Grudzielanek. He also ranked third on the club in hits, trailing Pujols (195) and David Eckstein (185). Grudzielanek became the first Cardinals second baseman to have as many as 30 doubles and 59 RBI in a season since Tommy Herr (30 doubles, 61 RBI) in 1986. With Grudzielanek at second base, the Cardinals won their second consecutive NL Central title and achieved 100 regular-season wins for the second year in a row. In the 2005 postseason, Grudzielanek fielded flawlessly, committing no errors in nine games for the Cardinals. He became a free agent on Oct. 27, 2005, and signed a multiyear contract with the Royals two months later. The Cardinals opened the 2006 season with Aaron Miles as their second baseman. I watched Grudz cycle game at the K of C..lunch break that turned into watching the whole game. He was a solid player I hoped would be with the Cardinals longer than a year. John: Thanks for your insights. I agree.